In February, Kai and I volunteered to participate in a study of local household waste. The study, prompted by a co-worker’s desire to learn more about the local waste cycle and composting, and sponsored by the Chittenden Solid Waste District, required us to take a hard look at our consumption and trash. Throughout the month, we measured what we threw into the trash, what we recycled, and what we composted (see results below). If you want a reality check on how much waste you produce, we recommend you do the same for at least one month. In this series of posts, we’ll talk trash and discuss ways in which to minimize or eliminate waste. We are what some people might consider fanatical about our household waste. It is true – we are fueled by some sort of perverse pleasure, a competition with ourselves, to create as little amount of trash as possible. I’ve heard some people express they don’t have time to do some of the things we do, but I would counter that if you just focus on incorporating one, then another, then another, small act of conservation in to your daily life, they will become normal, habitual, and, believe it or not, rewarding! 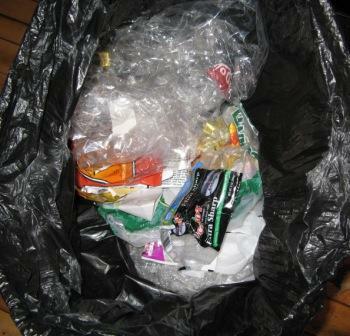 In fact, we have more time and money available to us as a result of our attention to reducing our trash. 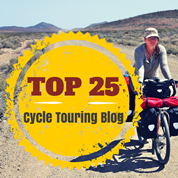 We use the time we gain, not in grocery stores or malls, but in our gardens, on our bikes, or updating our blog. The money we save goes toward our trip, our wee house, or dinner and social events with friends. Read on to find out how we do it. The study included data from a handful of households in our county. Household sizes varied, from 2 adults/2 kids/2 dogs to 2 adults (dogs were included because dog owners are required by law to dispose of their doogie poo so all the poo was included in the weight of trash) and included both composters and non-composters. The households that were chosen to do the study were, on average, already practicing conservation methods, as can be seen by comparing the local Average Household’s amount of trash per year, a whopping 913 pounds, against the Average Study Participant’s waste, which was almost 1/3 of that, at 327 pounds per year. I’ve highlighted our numbers in the chart below. We were excited to be tied with another household for the title of “Lowest Household Waste per Day” (of course, we saw it as a competition and, now, we have a self imposed goal to beat our own numbers!). As you can see looking at the pie charts below, of the households that composted, 32% of their waste was composted. 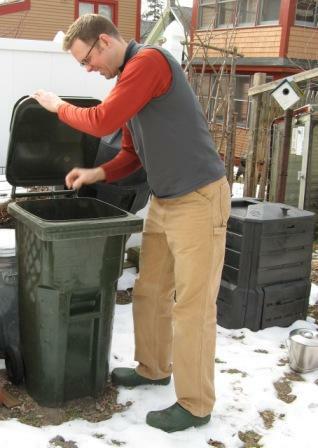 Non-composting households produced over 18% more disposable trash. Think of how much waste could be eliminated from the waste cycle if more people started to compost. We incorporate a lot of the items in the RRR (Reduce, Recycle, Reuse) list that I detailed in our last post into our daily practice. We carry stainless steel drinking containers with us everywhere we go rather than use disposable cups. If we’re heading to the local food bar we use their non-disposable plates and silverware or, if we’re taking the food to go, bring our own containers with us to use over the disposable ones. Our goal is to eat all of the food we buy without any going to waste (anything that does spoil we compost). 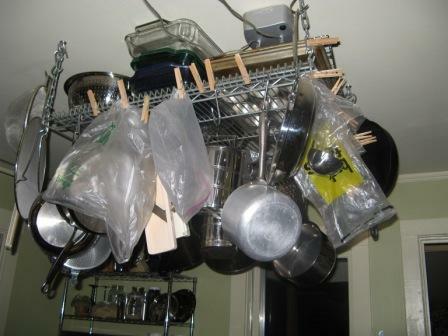 We buy the items we use frequently, or not frequently but that won’t expire or spoil, in bulk. Considering any item for purchase, packaging plays a pretty big role in our decision making process. We’ve been known to do without rather than buy something that has a cardboard or waxy paper wrapper inside a blister pack inside another blister pack (in fact, things like that usually make us quite angry…..what IS the point anyway?!?). 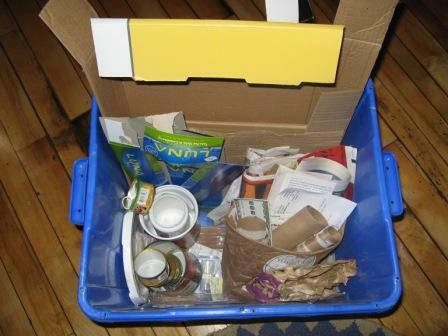 We tear down and recycle everything we can’t reuse or compost : boxes, junk mail, aseptic packaging, toilet paper rolls. 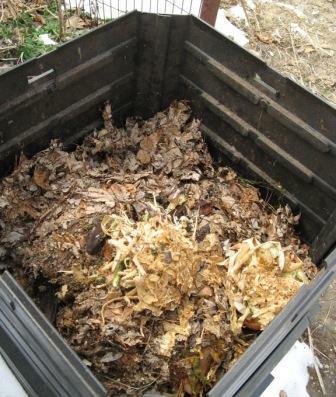 If it can be composted, it is (non-toxic paper, hair, food, wood or yard refuse). And, the hardest part of reducing waste, we try to eliminate it it from coming into our lives at all, by not buying things we don’t need or can’t consume, recover or reuse. 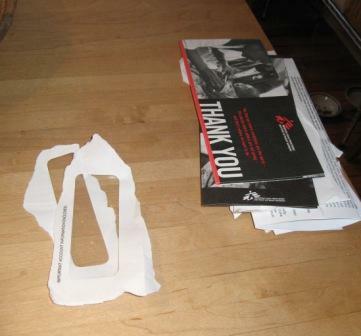 The photo to the left shows how we separate plastic windows from envelopes we receive in the mail. The paper gets recycled and the plastic goes into the trash. I can’t tell you how much we LOVE buying in bulk. Not only does it eliminate the need to make multiple trips to a store to purchase one – offs, it also results in wasting less packaging material and saves us a lot of money. Personally, I love the fact that when I’m in my pajamas and I realize we’re out of soy milk, I only have to grab another from our storage area (no stress!). We buy the following in bulk: dishwasher detergent, toilet paper, soymilk, liquid dishwashing soap (that huge plastic jug lasts a looong time), olive oil, canola oil, vinegar, balsamic vinegar, baking soda, muesli, granola, peanut butter, seitan, edamame, yogurt, olives, pasta, beans, rice, split peas, couscous, grains, sugar, nutritional yeast, spices, tea, catnip (for our cat Oliver), nutritional bars, canned tomatoes, coconut milk, flour, and many other things as seasons and our needs change. 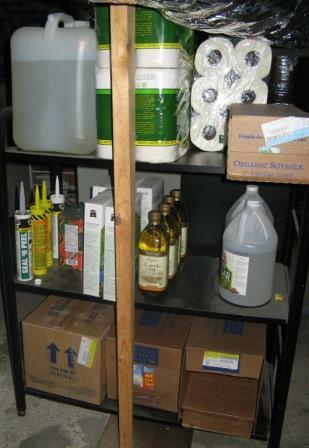 We store the items we don’t frequently use in out of the way locations, like the basement. Items we use often, like the peanut butter in the white tub in the photo to the left (By the way, that’s 9 pounds of it!! Kai has a healthy obsession with peanut butter. 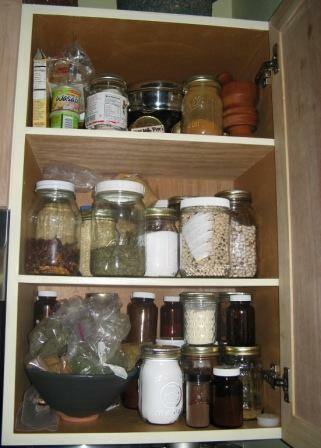 ), we store in the containers they come in on shelving in the kitchen, or we put smaller portions of items (like muesli and granola, which can come in up to 35 pound containers) into jars or containers and store them in our cabinets. 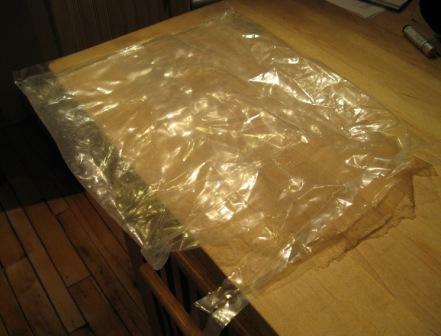 An added bonus to buying in bulk is that we can use the packaging the larger items come wrapped in as trash bags. We haven’t bought trash bags in years and we have reduced our trash so much that we have an excess of these bags waiting to be used. Plastic bags that are used to purchase food at the grocery stores are washed and dried, then put into our cloth shopping bags, along with our twist ties and zip lock bags we’ve accumulated over the years, then taken with us each time we go shopping, so that we can reuse them. We use the bags for transporting food and then usually, unless we don’t have a container, food is transferred into a glass or stainless steel container at home. All food waste from food preparation, loose tea or tea bags, spoiled food, and even our cat’s hair goes into the compost pail. During the summer months, I also recycle yard waste that is without disease. Using a stainless steel compost bucket helps eliminate any smells in the kitchen as it resists smells and is easy to clean. 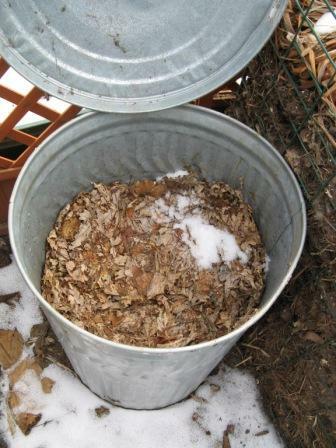 When we’re ready to empty the pail in the compost heap, we put a little water from our rain barrels into the bucket and swirl it around a bit to help dislodge any food particles that are clinging to the sides or bottom of the pail, then we throw it onto our daily compost heap. Leaves from the prior fall are collected and stored near the compost pile so that we can easily grab a couple of hand fulls to throw over our recent deposits to the bin. 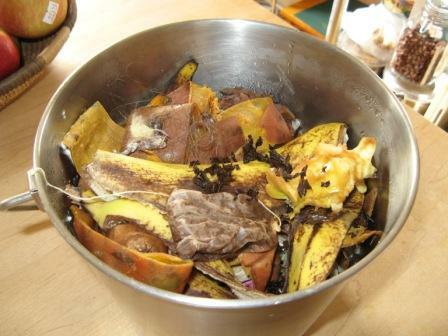 This keeps the smell down, pests away, and adds the “brown” necessary to successful composting. Occasionally we’ll stir or turn our everyday compost but most of the time we just let it sit and do it’s natural thing. Each fall, we remove material from the everyday bin and push it through a homemade screen to remove large chunks of unprocessed material from the more processed material. The processed material goes into our finishing composter for the winter, which is the round barrel in the center of the photo below, and the larger chunks go back into the everyday bin. Kai made the barrel composter as a birthday present to me when I was living in my condo so that I could put it on my patio and compost. 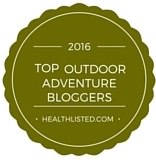 If you don’t have a yard, but have a space outside your back door, this is a great option. During the winter we turn the finishing compost bin every few trips we make to the compost pile and by spring it delivers the most wonderful, rich, nutrient filled compost for our gardens. 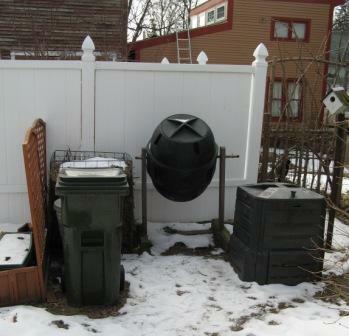 Any residual leaves, yard waste or grass clippings (although we usually just leave those on the lawn as they are known to make your lawn healthier) are thrown into an open wire compost bin (hiding behind our trash can in the photo). If the material I throw into that dries and browns up, I use it in place of the leaves for covering food scraps. It generally composts down on its own, over time, and requires no maintenance whatsoever. We recycle anything that we can’t reuse or compost. Make sure to check your local recycling center’s list of things they can take — there are a lot of items that can be recycled but sometimes people just don’t realize it and end up needlessly throwing recycables in the trash. Anything not reusable, compostable, or recyclable is put in our trash. It should be of no surprise to you that most of our trash is PLASTIC. The result of our efforts, as outlined above, is that we have very little disposable trash at the end of the day – so little, in fact, that we use the smallest trash bin available from our trash vendor and schedule only two trash pick ups each month. To top it off, we still call at least once a month to cancel one of the two pick ups because we don’t have a full trash container. Now…..if we could just get that down to a pick up every six weeks…. So, as you can see, we are fanatical about our trash but it has become a natural part of our lives. Doing the things listed above is not burdensome. On the contrary, practicing consciousness and intention in relation to what we leave behind in the world is quite satisfying. And, in our opinion, the relatively recent advent of our society’s “throw away” mentality will be short-lived. With the fall of the fossil fuel era, we will all be forced to reclaim the more practical, efficient and conservative ways of our ancestors. For this reason, we’re constantly on the look out for ways to reduce our trash or find better alternatives to our current practices. What about you — anyone out there have any tips for reducing waste?